Old tax lists of Tredyffrin township are warrant for the belief that between 1765 and 1767 there “was established by Jacob Sharraden, what seems a distinctive feature of German Protestant settlements – a place for church and school purposes; and that he was the donor, at least of the ground on which it was located.” This is the conclusion to which Henry Pleasants came in his exhaustive study of the early German settlers around Strafford when he was preparing to write his “History of the Old Eagle School”. 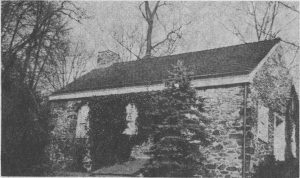 “It was possible,” Mr. Pleasants writes, “that the establishment of the Lutheran settlement near “The Eagle” had aroused the church members of old St. David’s Church, Radnor, from their temporal, if not their spiritual, apathy by an apprehension lest these Lutherans should develop into formidable rivals who might draw away support from their own church”. At any rate these Welshmen seem “to have been spurred on to increase their accommodations and conveniences at Radnor”. Tradition has it that the rigorous religious tenets of these first German settlers made it difficult to obtain additions to the membership of the first small log church. Apparently the old members removed to more congenial surroundings, and before their departure the combined church and school property was transferred to “a few chosen representatives of the neighborhood as trustees, who were to hold it for religious and educational purposes and the re- pose of the dead.” Jacob Sharraden, who had given the original acre of land on which the first little log building stood, was among them, moving from Tredyffrin township to Vincent township in 1771. It was probably in the year 1788 that the stone building, used for school purposes alone, was built, a date that is substantiated by the large stone now high in the south gable. It is held that the two structures stood side by side until 1805, when the log one was demolished. Regarding the erection of the stone building in 1788, there is a meager record. The residents of the neighborhood united to furnish the necessary masonry and carpentry work as well as the materials. Among these pioneer philanthropists were John Pugh, William Siter and Robert Kennedy, of Radnor, and Jacob Hazzard and Robert Grover, of Tredyffrin. In 1842, six years after the common school system of Pennsylvania came into full operation, the school boards under the new system succeeded the trustees in the management of the property. This probably was the main cause for the renovation of the small structure in 1842. It provided for the addition of the southeasterly end, which about doubled the school’s capacity. At this time the old door was walled up and an entrance made from the southeast end. The reminiscences of the three early pupils of the old Eagle School, Margaret Cornog, Joseph Levis Worrall and Joseph Fisher Mullen, as given in this column in September and October, 1952, were of the period previous to this renovation, while the school was still very small. 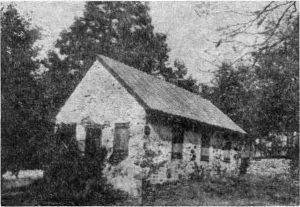 During the period of the Civil War, the building continued to be used as a schoolhouse, but by 1872 the School Board of Tredyffrin township had completed the erection of a new schoolhouse at Pechin’s Corner, about a quarter of a mile northwest of the Eagle School. As the only badge of ownership, the key to the old building was presented to the little Union Sunday School, then holding weekly services there. During the year 1873, the Sunday School organization was the only custodian of the property, and apparently there was no prohibition here against denomination. It is said that the building from time to time was used by preachers from the Christian Church, by Baptists, Presbyterians, Episcopalians and possibly Quakers. The last Sunday School service was held on October 12, 1873, when the School closed its sessions for the winter. 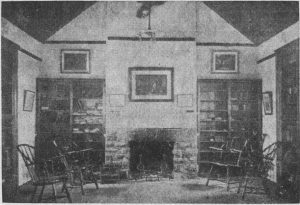 For a few weeks previous, teachers of the Sunday School had brought with them supplies of wood and of coal from which they built their fires. When they found that they could not sell property, the Board rented the building to one Elizabeth Dickensheet, who was better known as “Chicken Lizzie” because of the “members of the feathered tribe who shared her home”. The appearance of squalor and dilapidation which the whole property, including the graveyard, presented at this time was shameful. The occupation of the old building as a dwelling terminated after “Chicken Lizzie” was set upon by someone whose identity was never discovered. In May, 1885, a formal decree was entered, appointing Thomas R. Jaquette, Elijah Wilds, John S. Angle, M.D., Daniel S. Newhall and Henry Pleasants, as trustees. From this group Mr. Wilds was named president and Mr. Pleasants, secretary and treasurer. Funds to meet the preliminary expenses of restoration were obtained by contributions from interested neighbors and also from the sale of an historical account of the old school, as prepared by the secretary, Mr. Pleasants. During 1897-1898 further improvements were made by excavating a cellar under the entire building, by grading the reclaimed road bed, and by enclosing, with stone walls, that part lying west of the graveyard, along with many other extensive outside changes to the grounds. The first picture shown this week was made expressly for this column by F. G. Farrell and shows the school building as it looks today. 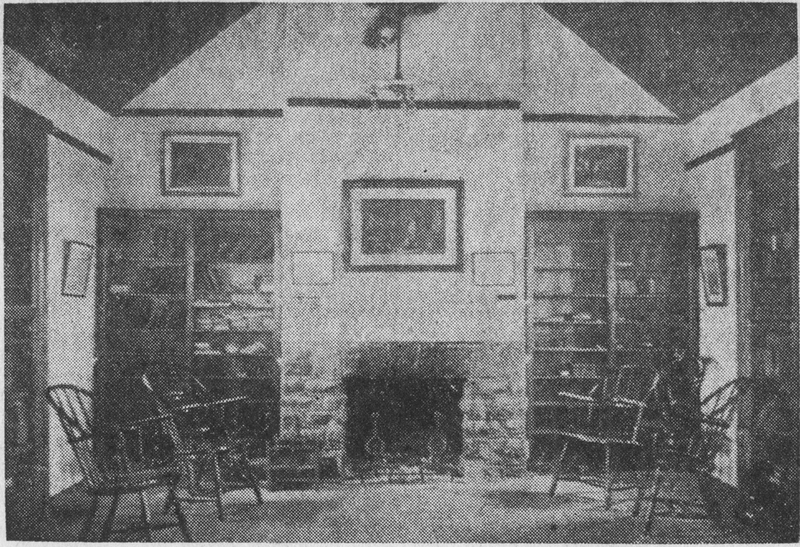 The second picture is from an illustration in Mr. Pleasants’ book, showing the interior of the schoolhouse after its renovation in the late 1800’s. The first picture shown in today’s column has been taken from an interesting collection of old photographs in the possession of F.G. Farrell, of Upper Gulph road, Strafford. It shows the little old Eagle School as it looked in the 1800’s, before it was restored to its present-day condition in 1897. This restoration was done by a Board of Trustees acting for an interested group determined on the preservatlon of one of the most historic landmarks in this section. Mr. Pleasants writes: “The interest of practically the whole community in the old place was substantially manifested in the many contributions offered to aid the work of restoration. None of these individual contributions exceeded $25. Up to this amount they varied from the unique contribution from 20 boys of the Malvern Grammar School, who at the instance of their teacher, Miss Hannah Epright, of Berwyn, contributed five cents each… the average amount of all contributions was $6.71. But the spirit behind the contribution, manifested in many ways, was perhaps the most inspiring feature in the unusual enterprise”. A picture of this restored building, as shown in contrast to today’s picture, will illustrate next week’s column. Many of the names of these trustees have been preserved, not in record form, but in the memories of those who have passed their names down from generation to generation. Among those from this neighborhood were William Siter, John Pugh, Nathaniel Jones, Samuel Cleaver, Robert Kennedy, landlord of “The Unicorn”, and Edward Siter, landlord of “The Spread Eagle”. Among other rural schoolhouses of an early date that have been preserved to the present generation are the Camp School, at Valley Forge, restored by the Valley Forge Park Commission; Diamond Rock School, near Howellville, and the Octagon School House near Newtown Square. From the time that the first small crude building, known as the Eagle School, was built, it was not only school and church, but also a social center of the rural life of the neighborhood. It was a public meeting place when militia companies were organized and drilled and when political meetings were held. On the lighter side of life it was the meeting place for singing groups and debating clubs. A quaint invitation, still in existence, to a debate to be held at the school in March, 1822, is early evidence that the Eagle School was among the pioneers in the “lyceum movement” which was to become an integral part of the life of the early settlers in this section. Records show that, as early as 1835, the Chester County Education Convention organized a County Lyceum, with a full roster of officers. And only a few years later the Radnor Lyceum was organized, with Hugh Jones Brooke, as president. Perhaps the most outstanding of these Lyceum meetings to be held in Old Eagle School was one already described at length in this column, the free exhibition of the telegraph in 1832. The second picture illustrating this week’s column has been taken from Mr. Pleasants’ book. 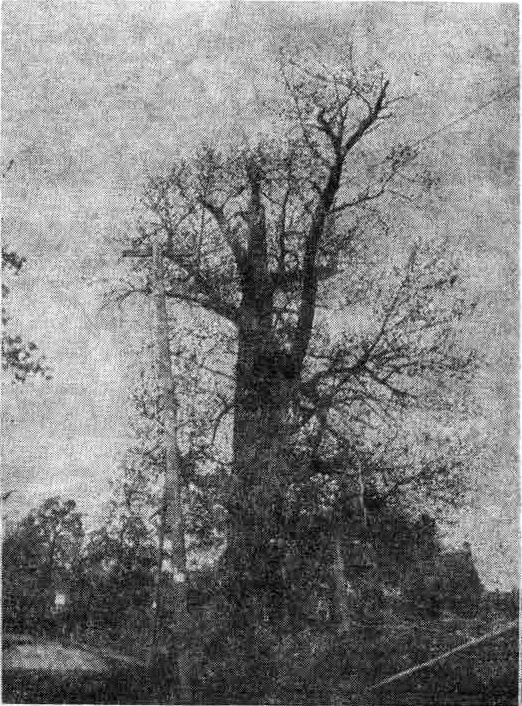 It is that of the “Sentinel”, the chestnut tree that was taken down when the Strafford drug store was built at the corner of Old Eagle School road and Lancaster pike. 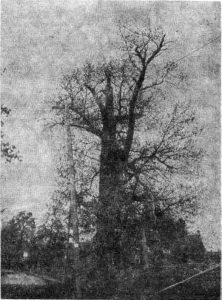 During the encampment of the American army at Valley Forge, the Spread Eagle Inn was used as an outpost, and this great tree, over six feet in diameter and some 75 feet tall, was utilized as a signal station for that picket. The next signal tree was just at the top of the hill north of the Doyle Nurseries. Other trees stood at intervals all the way from the one near the old schoolhouse to Valley Forge itself. L. E. Davis, of Weadley road, Strafford, still remembers the stories his grandfather told him of these old trees. When the big chestnut shown in today’s picture was taken down to make room for the drug store, it was rescued from burning by a Mr. Barr, of Phoenixville, who still has much of it stored in his barn. Mr. Davis himself has a piece of the old tree. And from parts of it Mr. Barr made bootjacks which were sent to the museums of a number of large American colleges. From time to time reference has been made in this column to one of the most interesting historical landmarks of rural Pennsylvania, the Old Eagle Schoolhouse. In its restored state it still stands on the hill north of Strafford Station, on the east side of Old Eagle School road. This road, one of the oldest in this section, starts at Lancaster Pike at the Covered Wagon Inn, and goes in a northerly direction under the Pennsylvania Railroad tracks. It was along this road that the first German settlers in Tredyffrin township made their homes, on a tract of land which was part of an original purchase by Richard Hunt, of Brome Yard, Hereford County, Wales, from William Penn in 1683. In October and November, 1950, three of these columns of “Your Town and My Town” were devoted to the early days of this German settlement, and to the building of the first crude structure for church and school purposes in about the year 1767. The stone, inscribed 1788, which is now set in the south gable of the restored building, supposedly belonged to a second building which was erected close by the first. Later on the two buildings were apparently made into one. In September and October of the year just past, three columns of “Your Town and My Town” were devoted to the reminiscences of three of the one-time pupils in the old school. One was Margaret Cornog, who was 90 years old when she wrote of her school days, which began in 1818, at the age of eight years. Another was Joseph Levis Worrall, born in 1817, who started his schooling in 1826 when he was nine years old. And still a third old-time pupil, who was born in 1824 and who attended Eagle School at an early age, was Joseph Fisher Mullen. Quite recently several pictures of this qaint old building have been made available to your columnist. And so, after a brief resume of what has already been written in regard to its early days, we shall bring the story down to the present with the aid of these pictures. In his book “The Making of Pennsylvania,” George Fisher says that Pennsylvania was altogether different from the other early colonies, in that it had a much greater “mixture of languages, nationalities and religions; Dutch, Swedes, English, German, Scotch-Irish, Welsh, Quakers, Presbyterians, Episcopalians, Lutherans, Reformed, Mennonites, Dunkards, and the Moravians, all had a share in creating it”. Of these settlers. the Germans were decidedly the most numerous. Two divisions among them stand out prominently, the sects of Pietists, and the Church people. The first included the Amish, the Mennonites, Shakers, Schwenkfelders and many others. The Church people were divided between the Reformed and the Lutherans, the latter of especial local interest, since it is of them that the settlement in Tredyffrin Township seems to have been mainly composed. Most of these original German pioneers were immigrant peasants, the first of that class to land in America. Many of them were rough in manner and in dress, and spoke a dialect that was almost unintelligible to those outside their immediate group. But they were a hard working lot, thrifty and frugal, who took their work of settlement in a new land seriously. For the most part they became farmers, who took good care of their cattle and of their property. The particular group of these German settlers along what is now Old Eagle School Road followed Welshmen who were the original settlers. With these Germans were a number of Swiss and even a few of the unfortunate Acadians driven from Nova Scotia. Following a custom of the homeland, these Germans probably built their combined church and school before they had even completed their homes. For tradition has it that the first small log structure to be erected on the approximate site of the present restored one served both of these purposes. 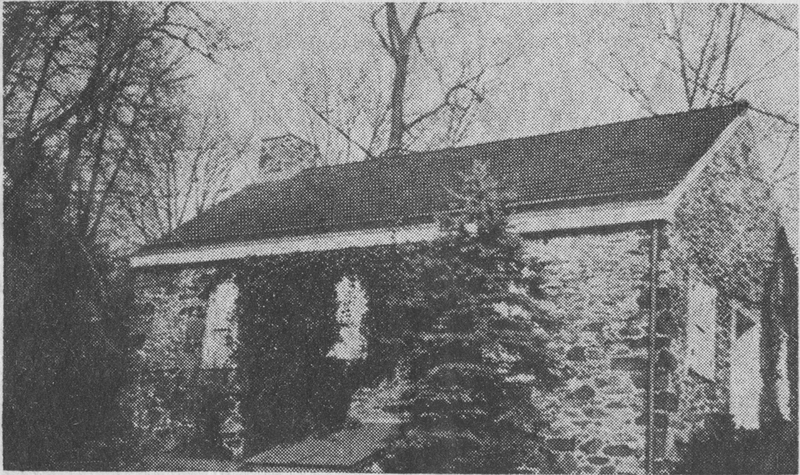 The first authentic evidence of the existence of the German colony in Tredyffrin Township is found in the deed books of Chester County which, according to Henry Pleasants’ “History of the Old Eagle School”, indicate “the purchase by Jacob Sharraden… from Sampson Davis and wife on March, 1765, of 150 acres of land in Tredyffrin”. It is followed, in March 1767, by a deed from Jacob Sharraden to his son-in-law, Christian Werkiser. These two men were undoubtedly the most prominent of the German pioneers connected with the establishment of the Old Eagle School. Jacob Sharraden died in 1774, leaving a will which indicates that he was “a religious German of some education and property”. Tax lists of Tredyffrin Township show him to have been the proprietor of a grist mill and owner of 150 acres of land. His son-in-law, Christian Werkiser, also owned a considerable amount of real estate in Tredyffrin. The tax list of Tredyffrin in 1768 shows that he was taxed with only 149 acres instead of the 150 which Jacob Sharraden originally held. This seems pretty direct evidence that the latter established “what was then a distinctive feature of German Protestant settlements – a place of church and school purposes; and that he was the donor, at least of the ground on which it was located”. This fact has been confirmed by several of the very early residents of both Tredyffrin and Willistown townships. Benches for the pupils were arranged in double rows around the side of the building, making a hollow square space by the fire- place. Here stood the schoolmaster’s desk. At first heat came only from this open wood fire, though later this was replaced by a stove, an innovation which was of distinctly German origin. Inside walls were entirely without plaster, while window sashes “slid sidewise on the inside, as is yet often done in old barns… there were no shutters to these windows. The front door was secured by a long wooden bolt, slipped into place by a crooked piece of iron, passed through a hole”. Quite frequently, after a column in this series has appeared in print, additional information that might have been used in connection with it comes the way of your columnist. So it was with the recent brief story on toll gates, which appeared in the column of December 5 in connection with the description of the painted highway markers on Lancaster Pike. Following the publication of this particular column, Herbert S. Casey, of Wayne, former president of the Radnor Historical Society, lent the writer several books of historical interest, among them one entitled “Overbrook Farms”, by Tello J. d’Apery, M.D. In it is a picture of a toll gate at the intersection of City Line and Lancaster Pike, which Mr. Casey tells us was the first one on the Pike as it left the City limits. It is particularly interesting to him because it was just across the road from the old Casey homestead, a large frame house which stood near the site occupied in recent years by the Green Hills Farm Hotel property, and where Mr. Casey spent his boyhood. Important as was the location of this toll house, since it was just on the boundary between Philadelphia and the suburbs, it was merely a little square box of a structure. Mr. Tobin kept the toll house for some years, and Mr. Casey recalls the amazement of all the neighbors that somehow the Tobins fitted their family of ten children into such a house. The next toll house to the west on the Pike, according to Mr. Casey, was one located at the northeast corner of Church road and Lancaster Pike, where an automobile repair show is now in operation. Still another was at Bowman avenue and the Pike . . . “a little sentry box” run by one John McGinley, which was not kept open at all times. And still another was in Rosemont, where County Line crosses the Pike near the new diner, at the foot of the long Rosemont hill. Two local toll gates, mentioned in this column under date of December 5, were the small cottage, once located at the northwest corner of Lancaster avenue and Chamounix road, in St. Davids, and the little white stone house, still standing, just to the west of the Spread Eagle Apartments, on Lancaster Pike in Strafford. “But perhaps it was a good thing, after all”, Mr. Faris goes on to say, “to have these charges at the small stream; they prepared one for the larger charge at such a ferry as that over the Susquehanna, 63 miles from Philadelphia. There the charges ranged from $2 per “Coach, etc. with four horses” to 25 cents for an empty wagon and 50 cents for a cart and two horses.” . . . No wonder an early traveller carefully records the number of streams of all sizes crossed while making a journey. However toll bridges and ferries were but two of the places where the traveller had to spend his money, For, at every tavern, there had to be a blacksmith shop. Since rough roads made for many repairs to vehicles en route, many times there was a waiting line for the services of these blacksmiths. The traveller who planned to make a long journey in his own conveyance usually had it thoroughly overhauled even before setting out on the road. The Blue Ball, at Daylesford, which is mentioned in this toast, is now the home of Mr. and Mrs. Paul M. Warner, for many years residents of Wayne. The history of this tavern was given at some length in this column last Spring. One detail which was omitted concerned a heifer which was owned by Prissy Robinson, one-time owner of the old inn, who, according to Miss Lathrop, “quarreled with the railroad by greasing the tracks until they were glad to settle”. Another nearby inn described by Miss Lathrop is the King of Prussia, so popular for its well cooked meals until recently, when the new turnpike has necessitated its closing. Miss Lathrop writes of its venerable signboard, supposedly painted by Gilbert Stuart, showing the King of Prussia “somewhat marred by wind and weather, astride a horse, decidedly wooden as to legs”. The author’s description of the building as it was up until a few years ago, brings back nostalgic memories to former diners there. And no story of old inns in Pennsylvania would be complete without mention of the Spread Eagle Inn, which has been so fully described in these columns that there is little to add from Miss Lathrop’s book. And last, but not least, is the famous old sorrel Horse Inn, once located on Sprout road, of which your columnist wants to write at a future date.